Well hello there, and welcome to adventure! To play these games, you just need an interpreter program. I recommend Hugor for Windows, Linux or Mac – Intel or PowerPC. 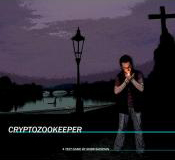 I created Cryptozookeeper between 2006 and 2011. I wanted to make a full-length graphical adventure game that had funny characters in offbeat situations, all within an alternate future. The central premise of the game is that you play a guy named Vest that discovers machinery that allows him to build cryptids from the DNA of normal animals. Sprinkle in some unwilling accomplices, a grim and gritty city to explore and some fun dialogue and you’ve got an idea what’s in store for you. Cryptozookeeper also attempts a kind of “episodic” slant towards adventure games. I wanted to make the game seem like the best season of television you’ve ever played. Retro-Nemesis is a game created of a short story I wrote for the documentary Get Lamp. The short story wasn’t able to be included on the disc, so I reworked it into a text adventure. In this game, Jason Scott and the player character attempt to interview Adam Thornton for the documentary. Everything quickly spirals out of control. Nominated for seven other XYZZY Awards, including Best Game, Best Writing, Best Story, Best Setting, Best Individual PC, Best Individual Puzzle and Best NPCs. There was a time, when I started working on Necrotic Drift, where there was no zombie media. It’s true! This was before Shaun of the Dead and the Dawn of the Dead remake. I thought zombies were finished. I wanted to do a game with them. Luckily, I did not stick only to zombies. All manner of undead creatures are here. Necrotic Drift is a game about a guy, Jarret Duffy, whose esoteric knowledge of Dungeons and Dragons comes in handy one night when the undead — vampires, ghosts, ghouls, ghasts, etc. — appear in New Haz, Colorado. 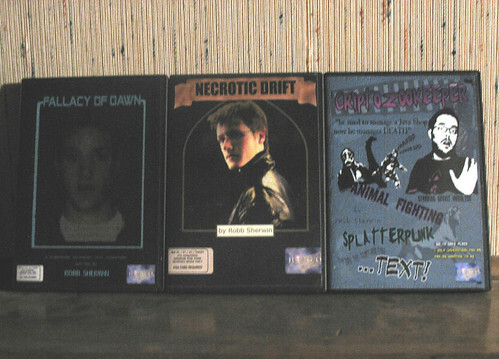 Nominated for five other XYZZY Awards, including Best Game, Best Story, Best Setting, Best NPCs and Best Individual PC. Text adventures go well with lonely, distant moons. Pantomime explores what it might be like to live on the Martian moon of Phobos, while at the same time looking into a future where people are able to make fully-sentient clones of themselves… and to everyone’s horror, others as well. http://www.joltcountry.com/index.php/robbsherwin_videogameYou must be logged in to post a comment.